Understand everyday signed explanations or descriptions on a range of topics including people, actions, behaviour, feelings, experiences, events, activities, daily routines. Recognise questions forms, negation, affirmation. 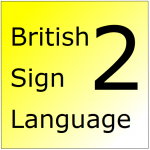 Use BSL to provide personal, social or work information using correct: sign order, handshapes, pace and flow, signing space, placement, referents, role shift, NMF.